Fraud!!! Don’t download this game! This game was so fun 2 years ago when I first saw it. Now it’s just a pay to win game and not even guns anymore with all the new updates. You gotta pay for like EVERYTHING! Don’t download anymore. Just a trashy game now. Crazy money involved to compete. After I play one match it won’t ever load a new match until I completely exit and re-load the game. This game was one of my favorite games to play with my friends back in the day. Now... now it’s a bunch of crooks that took over since the ad apocalypse. The game glitches every time a player would load into a map and it’s ridiculous. Do you honestly think I’m going to pay for a monthly subscription for a poorly developed game? 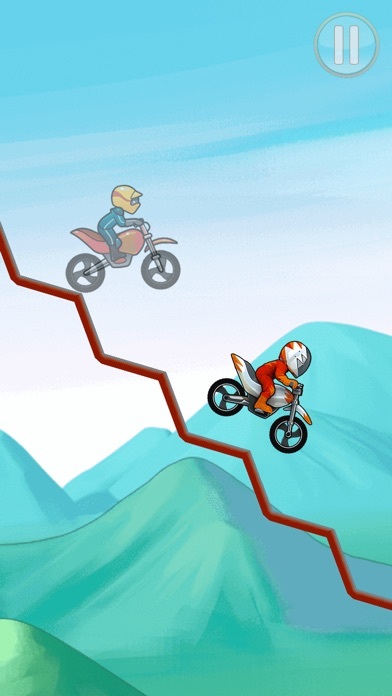 In the matter of 4 years “bike race” hasn’t changed except for their greediness. Don’t download cause it’ll waste your time! In Duel Mode - 2 weeks ago the game slowed to a crawl. Can’t find any players to match up. Sounds like company shut down all but one server or is neglecting maintenance. Collected our $$$$ and moved on to their next App. Excelente jogo. Uma pena que a versão paga seja muito cara ($ 8,00 por semana). Chega ser abusivo! This game is very fun and interesting! Fun for kids and everyone. Couple days ago the app started spazzing out. Refused to load anything and kept telling me to check MY connection. I deleted the app hoping it was a problem with my local save and when I redownloaded it, it won't connect to Facebook, my Apple ID, or gamecenter. So I have no access to any of the bikes it took me COUNTLESS hours to acquire. Garbage. What devil programmer peaked the rookie bike at 666? Change it. I hate that you have to tilt to tilt your bike! This game is very entertaining and fun. They don’t bug you too much about upgrades and in-app purchases. It something different you know so that’s why I like it and no lag or glitches. This game is great I love it so good...... I can play it when I'm board.. I love it! this game is super addictive but so confusing. i tried to play with @thotiana (my friend) but i couldn’t find the game. fix this. thanks. bye. So first of all this game is asking you to buy everything and there are a lot of ads. Second it’s just too hard. The only reason I got this was so I could get a reward on another app. At first I thought it was fun until I got to the harder levels. please full screen on iphone xs ! please ! After every level I complete I have to completely close the game and reopen it. Pretty annoying. I am uninstalling and will not download another game from this developer. Ads I can deal with, not the junk they are putting on here. I used to play this game back in the day and I got to say...I’m very disappointed. Yea they added cool duel/multiplayer features but don’t bother. Multiplayer is pretty much blocked behind a dumb pay wall and who’s idea was it to make it a subscription based service??? Who’s going to pay 7$ a week?!? I’d straight up pay 1 dollar to get rid of ads and wouldn’t mind dropping 3$ on a ghost bike for nostalgic reasons but 7$ is overdoing it. Overdoing it’ is an understatement. Absolute greed. Literally, the stupidest game I have ever played. First of all I think some of the things that people say to certain games is very disrespectful because it takes a lot of effort and time to make a game so I think I’ll green games are a great start. And of this game is one of those great games and I am just starting it right now and I’m really excited to see what comes my way in this game I’ve read some of the reviews somewhere very disrespectful and very rude and very disrespectful and there’s some I just love them because they were exactly like me and they don’t criticize games that technically they take huge amount of money to put the game on App Store so I think this game is such a great game and I’ll tell you what I think about it after I play it well thanks for reading this and to whoever comes to help my problems with people please figure out a solution please. I downloaded this for my 4 year old to play while out one night (since it’s rated 4+) and, since he can’t read, he must have inadvertently accepted a pop-up notice for a subscription of $7.99 per week. Without any authorization from me, he was able to make this purchase and I have been charged weekly since October 4th. Since I have other iTunes account charges that are variable, I did not recognize it until one week when they charged me twice. This game should not be available to children under the age of 6, if they are able to make purchases without requiring a passcode or other parental authorization. Furthermore, parents should be made aware that in app charges don’t require further verification before processing so that parents can watch more closely. No fine print will be sufficient in protecting customers from feeling mislead. The fact that the app includes “free” in the name makes this very ironic. I am honestly surprised by the high ratings. DO NOT DOWNLOAD!!! The first track of the hills is so freaking hard and, so is level 5 in the dunes. You can only race three times a day in multiplayer without having to sign in to Facebook. Not to mention that you also need to sign into Facebook to get most of the bikes. And you also have to sign in to Facebook to get vip and hills if you don’t have at least 23 stars in dune and if you click on hills if you don’t have it yet of course you have to sign in to Facebook like I said or pay $20 a mont or have 44 stars in total an 2 trophies which you can only get in multiplayer which like I said you can only race 3 times a day without of course signing in to Facebook but, other then that for the most part it is really fun and easy. I mean, this game is so much fun, I stayed up until midnight playing, so it’s addicting too. 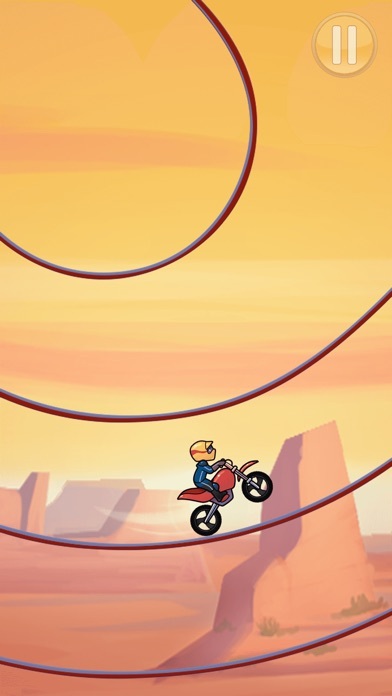 My one problem that keeps bugging me is that if I’m laying in bed my arm gets tired playing vertical like that, but when I turn onto my side my bike will flip. That is not my main problem but it does bug me, maybe you could do it where whatever position you start the race in is straight so I can be on my side or back to play the game. My mostly main problem is that the bike race VIP costs $7.99 a month! And you have to pay the much to get better stuff, maybe you could lower the price to something like $3.99 a month, that’s more reasonable. I know the developers have to make money but that’s SO expensive for just a game. Other than those problems this is my favorite game at the moment so others, be sure to try it! It’s so much fun! I deleted this app a while back, then saw it on the App Store again and thought, “hey I remember this being a fun trials-esque game”. After playing through about 3 levels I quickly recalled why I deleted this app... Everything is this app is aimed at one thing - Your wallet. Just wait for the constant (and I mean constant) pop-ups (NOT ads... 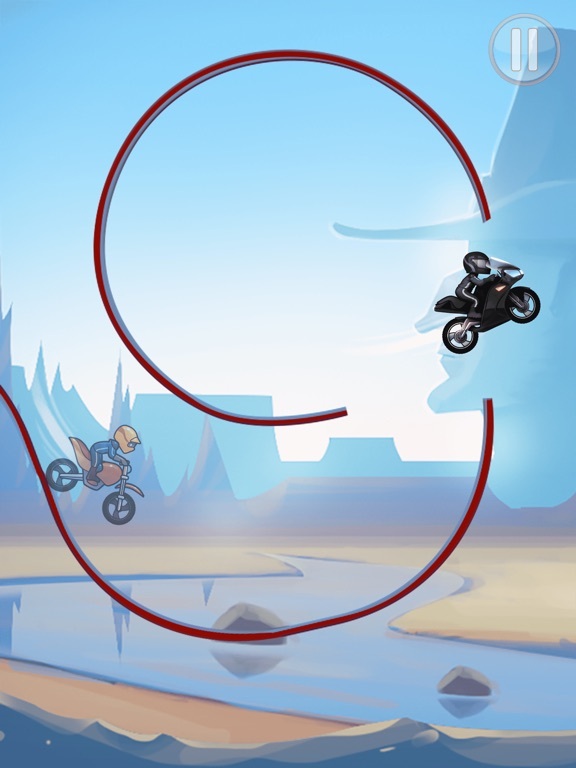 I don’t mind ads) asking you to spend upwards of $90/year so you can get super bikes, which make the game no longer fun, and play multiplayer, which is irrelevant because someone else just has to pay more money than you and they will have a bike that virtually levitates through obstacles faster than you could ever hope. I have to give them props for creating fun mechanics and levels, but alas it is ruined by the constant pressure to spend way to much money on a game that lacks competition or depth. I rest my case. (I was asked to review this game). Watch out for the ads! The game is good, and my whole family enjoys it. The issue I have is that the ads are definitely NOT family friendly! One ad has the Elf on the Shelf shown being moved by the parents, and my son started asking questions. Not okay, but I could kind of get over that. The one that really bothers me is the one where a woman is shown in very short shorts, twerking with her rear end right up in your face. I do NOT want my son or my husband to have to see that to play the game! I understand the need for ads, to keep the game free, but pleas make them appropriate!! I know lots of little boys who play this game, and I would hate to have to remove it from my son’s device because of the inappropriate ads! Game has some nice concepts. They throw a weekly, yes, weekly, subscription at you in order to do any of the non campaign features. Okay, $7.99 for a comparative game maybe worth it. They give you a week free trial. This is when the fun begins. Tournament mode (Most other games would call it ranked or ladder) is one of the worst match making systems. You upgrade your bike with coins you get from winning races. The higher level your bike the faster you can go. The downfall is starting around level 4, about 5:7 games are a 2 level gap. Meaning the other players have a 2 level speed advantage. So you have to hope they crash, or server timing is in your favor. As a level 4, I played against 5 level 8 accounts. There is *no* way for me to win aside from buying more coins (on top of the $7.99 sub) to upgrade your bike or hope you get lucky. Save your time and play something else. Sometimes if you have trouble and can't pass a level, you get so frustrated. I have those feelings because I only have a freaking Acrobatic Bike and that's pretty bad. I think they should make the bikes easier to get and the levels more less confusing. For example, on the level Savanna 2 the 6th level, it is so confusing I can't even beat it. Now about the tournaments. I think that there should be more tries on the tournament special packs because you only get two tries to do it and the levels are really hard so either they give us more tries or they make the levels easier. So I play this game a lot. I have a bunch of bikes but I feel something should be addressed. First of all, iOS should have world tour again. I have all world tour bikes besides England and USA because of the coins but since there is no world tour, I can’t get either of them. Also, I feel like there should be a way to trade tourney bikes. A bunch of people can’t get anything good because they’re either too high of a level so it’s ridiculously hard to get gems, or they just don’t get anything good because of how RNG based the chests are. I feel like trading would be a very useful mechanic and more people would probably play the game if there was one. Otherwise, I’d give this a higher rating but until these are addressed, I’ll leave it with a 3 star review. Great game. I play it everyday. The one flaw might be the matchups in Duel. I am Level 8 and in the Little Monster league, and I noticed how unfair the matchups can be. Today I faced a level 5 and a level 25. I know it’s based on your trophies but it would be better if they factor level into it. I’m fine with waiting a few extra seconds if that can happen. Otherwise this is an all around great game even though I will never pay for the VIP membership. ($8 really?) I don’t have Facebook so I can’t unlock some of the stages so I hope they just make it multiplayer wins. Thank you for reading my long review! I deleted the app because it kept wanting to have me try their 7 day free trial . Even with no internet it still ran adds . Ridiculous!!! Could even enjoy the game . Don’t download it . It’s a wast of time . Also on everything you click on it wants you to get the 7 day free trial . And what’s worse is that it doesn’t give you an option to X out of the ad . I had to completely close out the game and take it out of the task manager to play again . Wow . WHAT A WASTE !!! a game that could be enjoyable was messed up by forcing people to buy into their “ free trial “ . I see exactly what they are doing . They say ohh ... $7.99 per month is not enough to get people mad, If their kids “ accidentally” get the free trial then oops . Get 4,000 kids to do that . That’s just sad how far this app had to go to get money. Not taking mine . No thank you ! They fixed it! / but they need to fix one more problem! I had this game a long time ago, and there were not enough levels so I deleted it because I got bored of the levels. NOW they have a lot more levels and the extra levels don’t cost real money like they used to! They fixed it! There is no ads if there is I have not run across it yet! Over all this is a good game I recommend this. This is a great game give it a chance! I have not spent a dollar! I get bikes for ex! I love this I am giveing you a 4 Star is because it’s not perfect I get bored after a little while so can you make it more exciting & fun & interesting! Thanks for reading this! I’ve played this game for over 2 years, and all the people that say it’s p2w are completely wrong. I used to have an account with almost all the bikes, but lost it, and have now had the game for about a month and half. I already have almost all the bikes you can get from tournaments and have no trouble using those to easily win in multiplayer. I play this game for about 15 minutes a day, and in a month and half already have more than 1100 wins on multiplayer. Even if this game is p2w, you can still easily do well on it without spending anything, as I have. To start off, I understand why the developers put in game purchases into Bike Race. But I have also played this game since the early days of its arrival into app stores. I used to have a ton of bikes on my old kindle fire, and now I have just downloaded the game on my phone after about 2 years of not playing *or more*. But it really frustrates me that I used to have almost every bike, and now I need to become a VIP to get all of the bikes, levels, and some multiplayer things. The way this game changed has changed my childhood. I would come home from school and go straight to my kindle to play this game. To check if my opponent on multiplayer had sent a game back. But now I cannot do that and I need VIP for it. *btw I’m 13*. This was just saying that this game has changed a lot and I miss the old game. This game just cares more about money than actually producing a fun game. Before you wouldn’t have to spend so much out of your pocket to have fun & now 7.99/week for a subscription, that is complete nonsense. All this new stuff & all the money being charged just for bikes is ridiculous, this game used to be one of my favorites, I would compete with my brothers all the time, but now it is complete trash if I’m being honest. You can tell this game is all about making money now, they don’t even care if it’s fun or not anymore. And by the way the only reason why they have plenty of 5 stars is because they offer you free updates if you give them 5 stars. How lame lol, if they didn’t make so many unnecessary changes & have subscriptions then maybe they wouldn’t have to ask for 5 stars. I don’t know what you did but this is nothing like it used to be I used to enjoy this game now everytime after I play a game I get some screen that says pay such and such and you will get however many bikes or you get to do it for free and get you use every bike for a week but you need credit info witch is stupid cause they know after everyone uses the free thing they’re going to take the credit card off. Or you get a freaking add everytime you start up a new game it’s gets annoying I know you guys make money off of adds and all but man.... I shouldn’t have to play one game and then wanna delete it because adds keep popping up, it starts to get annoying and that’s why your downloads are so low so no, DO NOT DOWNLOAD unless they fix these few things!!!! I’m a kid who is not allowed to have social media or make in app purchases. So I have gotten through every level except the advanced ones because you have to either play with “Facebook friends” or waste your money. So now this app is doing nothing but wasting my storage. This is definitely not the first time someone has complained about this. This is completely dumb. Could you at least just pay the money and be done? Not have “VIP” stuff because I don’t know if you have noticed but all the apps that think they’re so cool and create “VIP passes” that basically throw your money away end up dying and everyone hates the game until the rest of time. So make it better, or leave it the way it is and never be remembered for being a good game. Your choice. P.S. You know that “Free trial” thing? ITS FAKE NEWS!! I used to have this game downloaded years ago, and it was so fun! 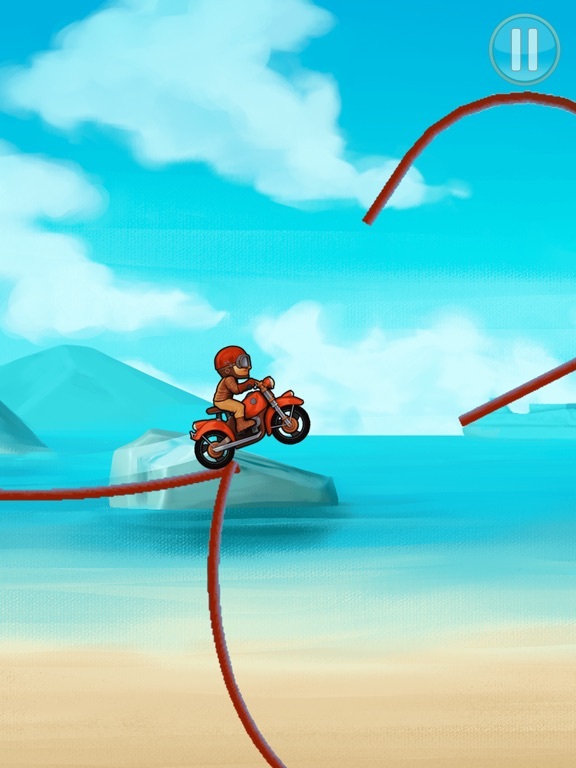 I could play against my friends, work towards unlocking new bikes and levels, and just enjoy the game! Since I’ve re-downloaded it, a lot of things are more confusing and not user friendly. Some bikes no longer show how to unlock them, I am uncertain if some of them are even unlock-able or if I have to buy them! I also don't like how the vip option comes up so often, if I was going to buy anything I’d just get the paid version and be done. Overall it’s still a great game, I just wish they’d change it so that you can see how to unlock bikes and your progress to unlocking things. I first downloaded this app a few years ago and really enjoyed it. Back then I would have given it a five star rating. I downloaded it again recently, remembering how fun it once was, but I was in for a shock with the new update. The emphasis on Facebook and in-app purchases make the game almost unplayable. There are constantly ads pushing you to buy VIP subscriptions and the "advanced" levels are only available to people who play with Facebook friends. As someone who does not have a Facebook, and reasonably will not spend $20 a month to play an online game, I'm quite limited as far as gameplay is concerned. The premise of this game has always been solid, but I no longer feel that it is worthwhile. I have a couple 3 star bikes but will likely never get kickass/super trooper because I’m not able to rank high enough in tournaments when they’re available as the prize. I’ve been playing a couple months and this weekend noticed my first chance at super trooper. I finished ~10th-12th place consistently which only gave me 2/10 chests. My biggest problem is that as soon as I start, I start off behind against identical bikes and once you get going it’s often impossible to catch up. How is that possible? My thumb starts my race; I should be dead even, right? What am I missing? Also, the special events seem a bit random in cost—7 fuel for the chance at an awd? Does anyone do those races? Myself, bought a bike( Maybe the super bike?) and never got I️t until much later. Then deleted the game after not having the bike. I️ just recently got the application again and the bike is not there. Even after hitting restore purchases the bike is sill not there. And when I️ get my previous account activated none of my bikes are there or the super bike. Please help / fix. Otherwise love the game. Sorry if I️t sounds like a 4 year old wrote this, my "i" is broken and makes the "i" look weird if "it" is the first letter. The game is fun and I pretty much only play duels because you have to pay money for everything else. I had the “Insane” helmet in duels on the old system and got to “Elite” a couple times. Then they switched to a new system. So far I have found this new one impossible to rank up in. Once I get to 1,000 trophies on one bike the scoring becomes rigged against me. I only seem to win 10-20 trophies at a time and when I lose, I lose 30-45 trophies. It makes it impossible to gain any ground and it’s completely random. It’s not based on speed or bike power or anything. I would just like it to be made a little more fair/reasonable. Or at least not so random. Maybe based on bike power? Could this PLEASE be fixed? Duel multiplayer is garbage. so is regular multiplayer. Duel is barely working like when your on level 1 you basically always win but then you get to like level 4 or 5 and the game literally makes you lose. Like people go faster than you even if you might have more wins then them or be on a higher level. and when you win you basically get 20 points rarely even near 30 points and when you lose you lose 35-40 points like it's unfair maybe if you change it like if you are a higher level you go faster or something. And in multiplayer (not duel) everybody is faster than me no matter who it is no matter what kind of bike skin i have or they have they are always faster than me. Zane i always lose and i think it's unfair and uncalled for. 1: Pretty sure all of these 5 star ratings are fake because they are short and they basically all say the same thing. 2: This has become a money grab game, like the "free trial" that's actually ten bucks (for a WEEK LONG membership.) 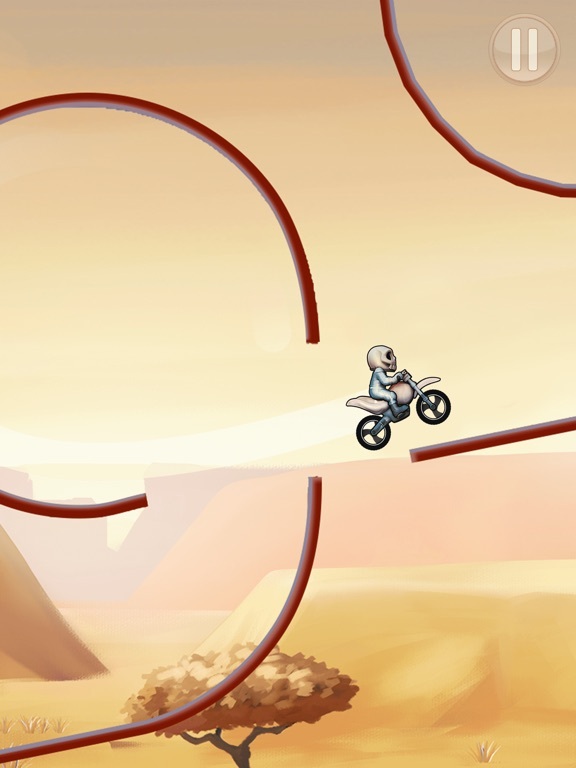 3: People who buy stuff like the ultra bike have WAY too much power over the free players. 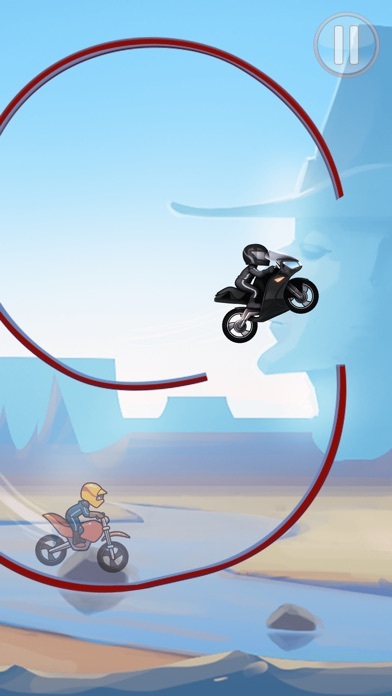 It is practically impossible to win against the ultra or super bike. 4: Tournaments start out good, but once you get to three-star bike level, you have to upgrade the bike to level FIFTY to upgrade it. In one star it was level 10. In two star it was level 15. Then 50? I don't even know what you have to get it to to upgrade the bikes in four star. 150? 200? 5: THIS GAME WAS SO GREAT. But now you have to pay to be good. Like I said, I am very disappointed. 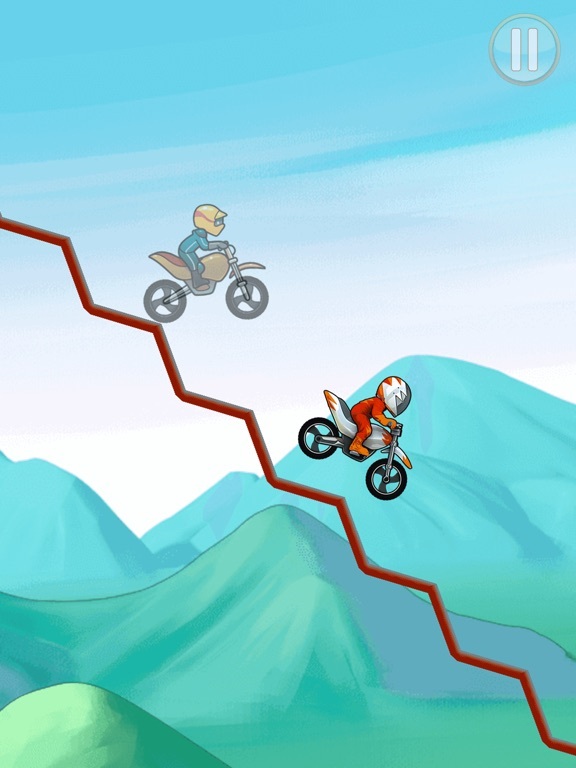 Don’t get me wrong, Bike Race is a great game. I’ve been playing it for years, but they made a change that kinda put me off. They changed the sound of the engine/motors (Idk). And they also changed the way the places looked in the menu That wasn’t too bad, but what really put me away was the fact that they changed the music. I LOVED the old menu music. I use to hum it all the time, but I can’t do that now since they changed it. Maybe you can add a free DLC or something that includes the old engine sound, the original main menu, and the original music. Ok this game is great 👍 I like it. One annoying thing is I can’t play the savanna lvls because I can’t win 15 or whatever number it is multiplayer rounds. Question: does duel count as multiplayer? Anyway, I disagree with the people who say duel is garbage. I think it’s great. The reason I gave this four stars (and wrote this review) is is because of duel. Duel is good, but not good enough. I’m lvl 5. Since I have so many trophies (like 782), I get paired with lvl 11!!!!! 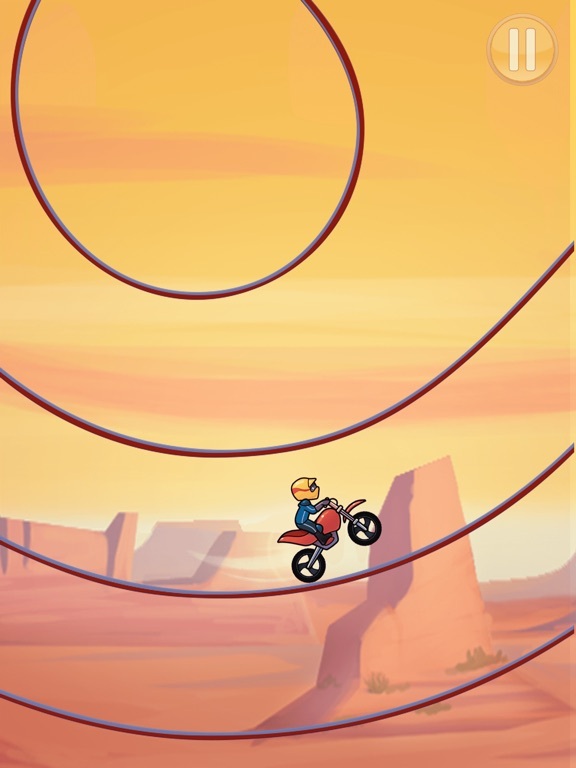 I’m NOT stupid I KNOW that the higher the lvl, the faster the bike which is very unfair! Even just lvl 6 they are still faster. YOU NEED TO FIX THIS BECAUSE IT’S VERY UNFAIR AND AGGRAVATING! I like this game but it has a few sexist elements. The first one is that the “girl bike” is pink, has wings, has glitter, and is very stereotypical for a “girl bike”. There is also only one “girl bike” and many, many more “boy bikes”. I don’t like how girls, including me, who want to play as there own gender, have to pick the pick the sparkle covered “girl bike”. The game would be so much better is there was a customizable bike, because my favorite color is green but I want to play as a girl and I don’t want a pink bike. A customizable bike would also be go for a boy who wants to play as a boy, but who wants to play with a pink bike. The game is good, but it would be much better if they added features that would make the game support both genders. Thanks! Played this game more than 5 years ago and it was great. However, just re-downloaded it and the app constantly begs you to start a “free” week trial. (Even though by agreeing to start the trial it gives the app permission to charge you $7.99 as soon as the trial ends.) I understand offering free trials but the pop up can not be easily X’d out of. The only options are to start the “free” trial and give the app permission to charge you or wait 2 minutes for a tiny “X” to appear in the corner of the screen. I literally only beat one level and saw the pop up THREE times. Visit the garage to change your bike? Free trial pop up. Finish a level? Free trial pop up. Visit the main menu? Free trial pop up. Don’t download this game, it’s worthless now. 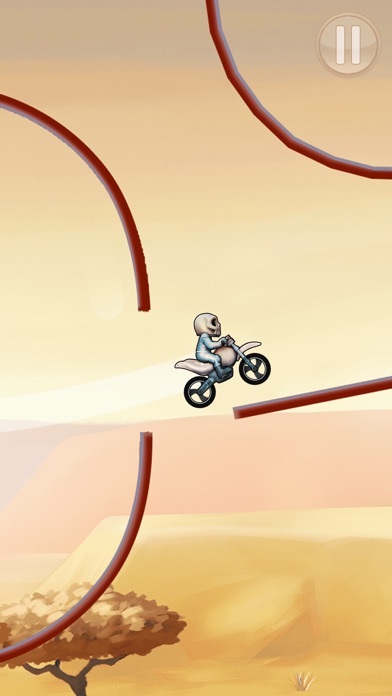 When I started playing this app it reminded me of the time I ran my bike into a tree. That day, I learned to ride a bike with training wheels on my 32nd birthday. It was exciting because all of my three friends were there. Mr. Cody, (my moms cat), my girlfriend Tonya, and my big toe. Anyways, I had just gotten the hang of the bike with training wheels and I was going downhill when all of a sudden and moth went up my nose. It made me sneeze and I swerved the bike into a tree. Then I woke up in a crib with my favorite stuffed animals. My mom gave me a glove and said,” do today’s abcmouse!” And I said,” ok ma” then I graduated abcmouse 2nd grade and I earned another glove. Thanks to the app I remember that fun time. No excuse me, I have to mourn the death of mr. Cody. Get the app and enjoy memories. ok so i got this game after seeing an ad bc of all the nostalgia from a few years back when i’d play this game on the school computers. however, it’s honestly just garbage at this point. 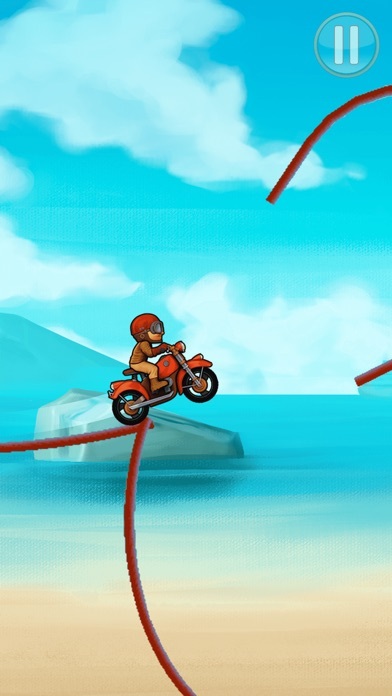 the gameplay is halfway decent (only halfway decent bc u basically have to buy the bikes to get all the stars), but every single time i finish a level, they shove an ad in my face and then ask me to pay $7.99 a week to get rid of them. ridiculous. i cant even x out of the subscription window so i’m forced to close the app every time i play a level. i understand that people need money to survive but at this point it’s just being greedy and i don’t think this is a good way to get money anyways. i’m assuming that many people would get tired of it as i did in just 10 minutes and uninstall rather than pay so much money every week just to be able to play this game. please fix this. this game is practically unplayable, which saddens me since it used to be so good. also, the developers need to stop faking reviews to get downloads. like please, use the time to fix the app instead. Bike race has been around for as long as I can remember and I grew up playing it, the only complaint I have is the duel mode is flawed. Instead of being up against racers that have the same trophies as you, it should be you against racers the same level as you. I am currently a level 4 and it’s hard to progress if I’m playing level 6 and 7’s, and even once a level 13. If this change could be put in place it would be greatly appreciated because I love this game!!!! !